The feud between New York Times and WikiLeaks has reached a new high as WikiLeaks alleges that the Times warned Hillary Clinton’s State Department of their release schedule for the “Cablegate” diplomatic cables revealed by WikiLeaks in 2010. WikiLeaks acquired over 250,000 US State Department diplomatic cables from Chelsea Manning, a US Army intelligence analyst. In November 2010, The New York Times along with several other large outlets released the first of these cables, which revealed candid conversations of US officials on subjects such as the War on Terror, US intelligence operations, and even a revelation that American and British diplomats briefly spied on then-UN Secretary General Kofi Annan in 2003. WikiLeaks did not intend to share the cables with the Times. The Times instead received them from The Guardian, which had been given leaked cables by WikiLeaks. The Times revealed the documents they had received over nine days. Now, WikiLeaks has revealed that the NYT emailed their schedule of reveals to the US State Department ahead of time — which they claim was done to give the US State Department, then headed by Hillary Clinton, time to "spin the revelations or create diversions." The email, sent from New York Times national security and intelligence journalist Scott Shane, includes a schedule for Times' releases. It also concludes several offers to "talk about any other concerns" the State Department might have about the Times' disclosure. Shane called the allegation "nonsense." He claimed that the Times' email was sent with the cooperation of WikiLeaks volunteers to protect the identities of State Department employees "who might be imprisoned or worse from cables we published." .This is nonsense. Check with the WikiLeaks volunteers who worked on this project. You'll learn WL created an online redaction engine so we could take out names of those who might be imprisoned or worse from cables we published. WL agreed on the consultation with State Dept. WikiLeaks fired back, saying that the email says nothing about protecting identities. "The email shows the NYT betraying the entire day-by-day thematic publication plan to Secretary Clinton's spokesman PJ Crowley — not asking questions," they wrote. 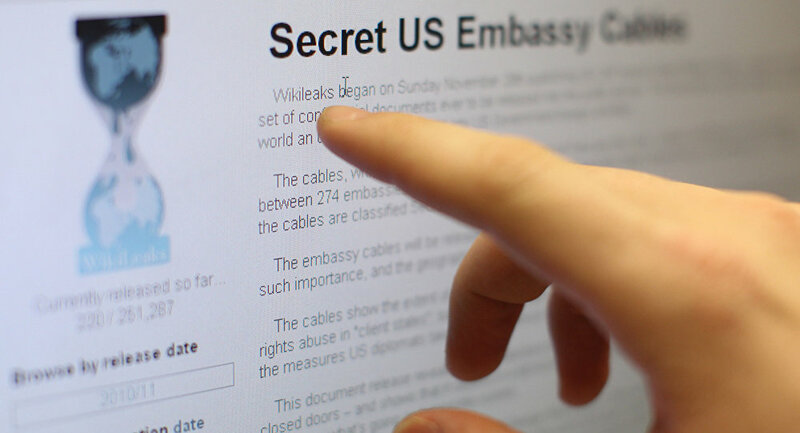 WikiLeaks agreed to pose questions to US govt 48h prior to publication. NYT pushed for 4 days (WikiLeaks objected). The email shows the NYT betraying the entire day by day thematic publication plan to Secretary Clinton's spokesman PJ Crowley — not asking questions. Shane replied that the Times discussed their releases with the State Department "by agreement of all media partners" — seemingly implying that all outlets who revealed the leaked files had similar lines of communication with the State Department. He added that WikiLeaks participated in the redactions to protect those that would be harmed if named. .Wrong. By agreement of all media partners, we talked at length to State Dept each day about cables involving a particular country. They lined up country specialists. It worked well. WikiLeaks helped organize the redactions to protect people who might be harmed if named. The email in question came from the laptop of Anthony Weiner, a former US congressman from New York who was convicted of transferring obscene material to a minor in 2017. From 2010 to 2017, Weiner was married to Huma Abedin, a close confidante of Hillary Clinton who also served as her deputy chief of staff during Clinton's tenure as secretary of state. On Tuesday, US President Donald Trump claimed that Abedin had "disregarded basic security protocols" and allowed classified information to fall into the hands of foreign agents. He also called for her to be prosecuted. ​WikiLeaks tweeted support for Trump's tweet a few hours later, specifically the part where he refers to the Justice Department as part of the "Deep State."